A very fast, easy and hassle-free Pearl Harbor visit. No waiting in line, Pick up from Honolulu Airport directly to Pearl Harbor. We will provide complimentary cold drink, transfer with the clean, nice and fully insured vehicle by professional chauffeur. USS Arizona Memorial and USS Bowfin Submarine, Pacific Aviation Museum and USS Missouri tickets are included in this package for clients. You will be picked up by our chauffeured style vehicle and taken to Pearl Harbor where you are offered a cold drink of water or tropical juice before accompanied to the entrance of the Visitors Center. You will be met by our supervisor dressed in black with a gold tie to give you a brief orientation and provide your vouchers & tickets. Feel the comfort as we takes you to the most visited Pearl Harbor historic sites. 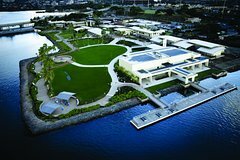 This executive level small group Pearl Harbor tour includes the USS Arizona Memorial, USS Bowfin Submarine, Pacific Aviation Museum and USS Missouri tour. Visit Pearl Harbor with us and enjoy this executive level small group tour. We are trusted provider of luxury tours in Hawaii, offering VIP services at the most reasonable rates. Pamper yourself and have a comfortable and worry-free tour in an executive van when you book this package today! Our chauffeur will pick you up from Honolulu Airport and take you to Pearl Harbor. We’ll manage everything for you before your arrival to Pearl Harbor, so you can avoid long lines and enjoy a hassle-free tour. • Bottled water or tropical juice includedWe are not responsible and does not extend financial reimbursement for delays caused by factors such as traffic, weather, mechanical issues, or problems concerning Navy-operated shuttle boats. The U.S Navy have right to shut down the boat for public safety. This is beyond our control and power we cannot be hold responsible for their action.